We accept phone orders at (714) 530-2577. For your convenience, you may submit the following form online. After you complete this form, we will call you to confirm your order and get your payment information. For security reasons, you will be contacted personally for your credit card information. 13 Kits at $20 per month, plus shipping. Kits include fabric, pattern and embellishments and are sent USPS Priority mail. 6 Kits at $25 per month, plus shipping. Kits include fabric, pattern and embellishments and are sent via USPS Priority mail. 14 Kits at $25 per month plus shipping. 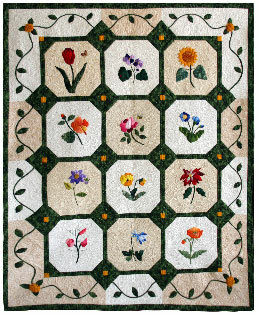 Kits include pattern, fabric, and embellishments for a section of the 64” by 64” quilt. 10 Kits at $27 per month plus shipping. 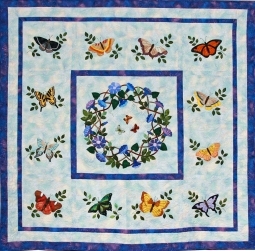 Kits include pattern, fabric with background, and embellishment package. 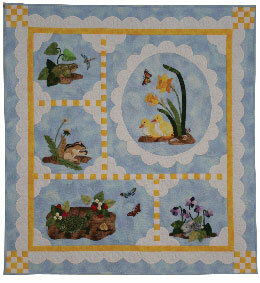 Terms: You will be receiving one fabric block kit per month until the series you have selected is completed. The sashing and border kit is sent out last after all of the individual block kits have been sent. The credit card provided will be charged on the first of each month for a fabric kit and shipping. Kit prices are varied and are outlined above. 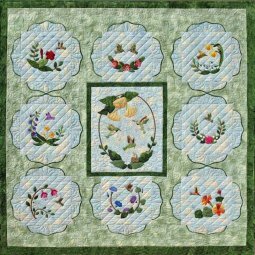 The fabric block of the month series can be discontinued at anytime simply by calling or emailing prior to the first of the month. An email confirmation will be sent when your order is received. Your credit card will be charged for your first fabric kit on the first day of the month following your order date. Orders outside the United States will be charged additional shipping and handling.